After the Virginia Department of Transportation repaves Gallows Roads, sometime in the next few months, Fairfax County will paint new bicycle lanes on the roadway. Plans for repaving and bicycle lanes were outlined at a community meeting March 13 in the Mason Government Center. 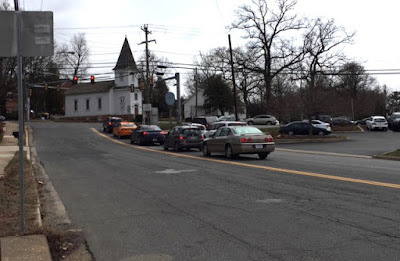 On Gallows Road, the Fairfax County Department of Transportation will install a buffered bike lane in both directions between Columbia Pike and Annandale Road. The road is more than wide enough to fit those lanes in, as well as parallel parking, said Chris Wells, the bicycle and pedestrian manager at FCDOT. Bicycle lanes will also be added to Industrial Road in the Edsall Road industrial park in Springfield. There will be one bicycling lane westbound and a “sharrow” in the other direction. A buffered bike lane is a lane set aside for bicyclists with pavement markings forming a barrier with the traffic lane. A protected bike lane has some sort of physical barrier, such as flexi-posts. When a roadway is too narrow for bike lanes, FCDOT puts up pavement markings indicating a shared lane, or “sharrow,” warning drivers they are sharing the space with bicyclists. Gallows and Industrial are two of the many dozen roads – ranging from heavily traveled corridors like Braddock Road to small neighborhood streets – on VDOT’s repaving schedule for 2018. See the full list here. The repaving will start in March or April depending on the weather and will conclude by November. When selecting roads for repaving, VDOT considers pavement conditions, using a camera attached to the bottom of a van, as well as traffic volume, economies of scale, and feedback from maintenance crews, said Allison Richter, transportation and land use director for VDOT’s Northern Virginia District. VDOT prefers repaving a whole neighborhood rather than piecemeal projects across a broader area, and it includes projects in all supervisory districts. Before the paving starts, no-parking signs and door hangers will be put on affected streets. The paving is usually done from 9:30 a.m.-3 p.m. If people leave a car on the street, the police will try to find the owner, but if they can’t, they will tow it. They won’t give tickets, though. When VDOT updates its repaving map, you’ll be able to click on a road to see the contact information for the project manager. The VDOT budget for road maintenance has risen in recent years, allowing more repaving to be done annually, although the agency is still in catch-up mode, Richter said. In 2013, the NOVA District received just $58 million for road maintenance; by FY2018, funding climbed to nearly $141 million. While widening a road to add bike lanes is costly, the cost of adding striping to an existing road is relatively insignificant, Wells said. Striping has additional benefits, as well as expanding the bicycling network, he noted. When a roadway is narrowed, drivers tend to reduce their speed. Also, parking is delineated better, and the sight line is improved for people pulling out of a driveway. According to Wells, FCDOT is moving away from focusing on the “Type A cyclist” who is strong, fearless, and comfortable riding with traffic, to the less less-confident cyclist who prefers buffered or protected bike lanes and avoids main roads. Click here for more information on VDOT road projects and traffic conditions. Submit complaints about potholes or other road issues here. Great news, glad to hear it. The road is definitely wide enough for a bike lane. I agree. This is good news. Thanks, Ellie! While I used them all the time in DC and love bike lanes, I haven't seen one person using the bike lanes in Annandale yet, and I'm waiting for it to become more familiar before I get out on a bike and be the guinea pig for other drivers to become familiar with! The Gallows and Columbia Pk intersection can get pretty crazy too, I think biking around that intersection will be pretty dangerous. As long as they keep Gallows Road in good shape, bike lanes are OK (although I have yet to see many bikers on the existing ones). But the road is so bad now that you have to use the whole road to dodge potholes. Since the road is wide enough, I wonder if they can make two left turn lanes at the intersection in the picture. The green light time is so short that there is usually a massive backup at rush hour. Biked to Annandale from Merrifield once. At first, the ride was very pleasant-- nice lanes/paths and wide sidewalks. Then after Fairfax hospital it got dangerous. If you put bike lanes/paths/whatever from Fairfax Hospital to downtown Annandale, it would essentially make Annandale easily bikeable to Mosaic, Tysons, Vienna AND the W&OD trial-- which everyone in NoVA loves and uses frequently. Likely would make Annandale a more desirable location to live- not as expensive, but accessible to those desirable places. Like your idea to putting a bike lane from Annandale to Fairfax Hospital and possibly to Dunn Loring-Merrifield Metro Station. Maybe people taking the metro to work would bike up to there and then hop on to the metro. We need our bike lanes to connect to Arlington and Alexandria bile lanes so that we can safely commute to DC for work. Why is that so hard for Fairfax to figure that out and plan for it? Getting to the Four Mile Run bike trail is like going from bike hell in FFX to bike paradise. Connecting to Four Mile Run trail would likely have to be done all on Columbia Pike which might be tricky because messing with that road is likely not an option, but there's a lot of sidewalk there in some spots, so it could be possible. If Fairfax were easily connected to W&OD trail and Four Mile Run by bike, Fairfax property values would probably skyrocket. Seminary Rd to Beauregard/Walter Reed could work! The current lane that is on Beauregard is a shared lane with vehicles. Its too dangerous so I bike on the sidewalk. Walter Reed is great, but then its Arlington. Given the age of our supervisors in FFX, they JUST DONT GET IT! Seminary to George Mason already feeds directly into Four Mile Run (but i think the actual bike lanes dont start until you reach the Arlington limits on George Mason). I believe there are plenty of options to do this at low cost, but agree there has to be the will. Even non-cyclists who might be annoyed by bikers would likely appreciate the benefits of having bike-friendly people in their neighborhoods, least of which would be some traffic relief. If they made many of these routes like that path on Walter Reed that feeds into Four Mile Run, that would pretty much do it. All of Columbia Pike could probably be that, same with Gallows. How much would it cost just to pave the sidewalk to make it bike friendly? VDOT should be pushing for quality re-paving of our thoroughfares, which are in extremely poor condition. FCDOT should be pushing for quality re-paving of our neighborhood streets, which are horrendous. If I were looking today to move to Fairfax County or into my present neighborhood, I would pass. Road conditions are key to all sorts of travel - commuting, pleasure, and shopping (all critical to the tax base). Road condition plays into maintaining and increasing property values in our neighborhoods (also critical to the tax base). They say they consider pavement conditions, using a camera attached to the bottom of a van. This was done in my neighborhood 4 years ago, where the results were recorded as extremely poor. VDOT pays no attention to our street conditions, unless we report potholes. Then they throw some gravel in the hole, which becomes wallowed out in no time. My neighborhood roads are a disgrace and all we hear are excuses. Now the 2018 Paving Schedule is out and guess what? We aren't on it .... again! We live in a very active, outdoorsy neighborhood, where people walk, ride bikes, skate, and play. However, there are no sidewalks and the streets have become more crowded with cars parked along the curb. The road conditions being so poor has gone from an annoyance to a safety issue. There is no relief in sight. Bike lanes may make a place more desirable to live, but only to those who bike. Before spending all our allocations on bicycle commuters lets get the core infrastructure in shape .... and keep it that way. We expect better results from our tax dollars than this.